As of today 3/12/2018, There are 2 homes for sale in Penderbrook, 7 homes under contract and 11 homes have sold in the last 30 days. This includes homes in Penderbrook Square, Oxford House, Heights at Penderbrook, The Mews (Wedgeway), Inverness, The Greens, & Fairways. According to MLS, there are 4 Condos, 2 Townhomes, and 1 Single Family Home under contract. 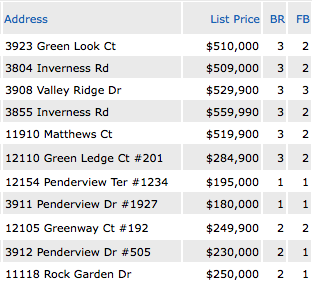 According to MLS, 5 Condos, 6 Townhomes, and 0 Single Family Homes have sold in the last 30 days. Last month 9 homes were rented, 6 currently pending and 6 homes are active for rent.